Try these homemade fiber cakes — similar to those at TJs, only better and less costly. You won’t feel hungry after eating one, and you get the fiber you need for under 100 calories. Pre-heat oven to 400. Mix dry ingredients (save prunes & blueberries until end), then mix and add wet ingredients. Stir until incorporated, then add prunes and blueberries and fold in. Spoon mixture into muffin tin lined with paper cups — resulting muffin will not rise appreciably & retains same profile. Bake for 20-22 minutes. Remove from oven and cool. Refrigerate or freeze (recommendation: microwave before eating to bring out the flavor and texture). Makes about 8 muffins. Wrap 1 prosciutto strip around each asparagus spear, barber pole-style. Place 1 phyllo sheet on a work surface (cover remaining phyllo to prevent drying); coat phyllo with cook spray. Cut crosswise into thirds to form 3 (4 1/2 x 9 inch) rectangles. 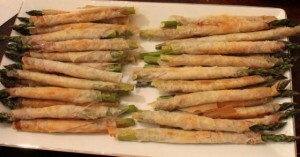 Arrange 1 asparagus spear across 1 short end of each rectangle; roll up jelly roll style. Arrange rolls on baking sheet; coat rolls with cooking spray. Repeat procedure with remaining phyllo, asparagus, and cooking spray. Bake at 450 degrees for 10 minutes or until phyllo is golden and crisp. Serve warm or at room temperature. You can also chop the prosciutto and sprinkle it on the phyllo before rolling. Make-ahead tip: Arrange assembled rolls on a baking sheet, coat with cooking spray, and cover; store in fridge for up to four hours. Bake an hour or two before the party. Look for the cleanest food on the menu. 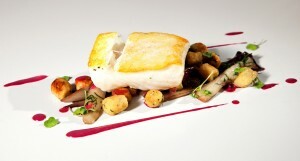 Select the lightest meat or fish, so that the added butter/sauce is not fat on top of fat. Peel cucumbers in lengthwise strips, leaving thin strips of skin between peelings. Slice cucumbers into very thin rounds, and place in a bowl with rice-wine vinegar, 3 T dill, sugar, and 1/4 t salt. Toss to combine and set aside. Heat grill or grill pan until very hot. 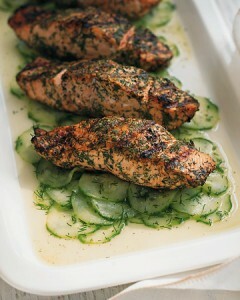 Place salmon on a tray, sprinkle with remaining 1/4 t salt and the pepper, and coat with remaining dill. Transfer to hot grill, and cook several minutes, until nicely browned. Turn over, and continue grilling until just cooked through and flaky. Place pickled cucumbers on a serving platter, top with salmon fillets, and serve.